The Iron Lady is a biopic about the former and first female Prime Minister of the United Kingdom, Lady Margaret Thatcher (Meryl Streep), tracking her rise through the political ranks to Prime Minister, through to her fall at the end of her time in power. Alongside this narrative storyline we are also presented with a second parallel narrative of Thatcher today, as she reminisces images of her past and hallucinates conversations with her deceased husband (Jim Broadbent). Meryl Streep provides the audience with a truly captivating portrayal of Lady Thatcher as to be expected, with her role far and away stealing the show. Supporting roles from the likes of Jim Broadbent, Alexandra Roach and Harry Lloyd are also wonderfully acted out yet unfortunately forgotten in the shadow of Streep's lead role. However these performances are not enough to fully salvage what is certainly a flawed film. Whilst the interlinking narrative storyline attempts to cleverly freshen up the film by contrasting scenes of Thatcher in and out of power against each other, the constantly changing narratives did little more than to disrupt the flow of the film and take you out of the interesting story of the younger Thatcher in order to show her in her mundane and psychologically challenged life today. Whilst in certain films the use of a similar jumping narrative structure (including the phenomenal films 'We Need to Talk About Kevin' and 'The Prestige') works very well and to the advantage of the film; by raising questions and curiosities within the viewer as they try determine how the story will get from point A to B, and how it will all be resolved and pan out in the end (through the restriction of knowledge and information, etc). However in The Iron Lady we are not made to ask questions, firstly as this is based on a recent and well-known historical figure that so many people already know about, but mainly because when we leap to the present narrative we only see the elderly Thatcher (who strangely resembles the Gran from Catherine Tate a lot!) reminiscing and hallucinating, which in no way raises any questions about the other narrative and what will occur in it - merely slowing down the film and making it longer than it needed to be. This poor choice of narrative structure is what ultimately lets the film down. A film based on a topic that has so many possibilities as Thatcher's does certainly has the potential of being far better than this turned out to be. Had the film focused on a simpler single linear narrative rather than messing around with the concept that it chose to use then they could have produced a far better piece of filmmaking that could have easily ridden on the back of the triumphant success of last year's 'The King's Speech' (one particular montage sequence during the film when Thatcher decides to run for Conservative leader and takes vocal lessons could have easily been lifted straight from or into 'The King's Speech'). This would have allowed for the film to show Thatcher's story in a far more fluid, engaging and powerful way by focusing more on the far more interesting narrative rather than wasting time by jumping to a second narrative that serves no purpose other than to slow down the film and try to make people who aren't already fans sympathise with Thatcher today (they could have even left some of these scenes in at the end - admittedly one moment during this narrative was actually very effective and emotional, but not enough to justify this poor narrative as a whole). When the film got going in the scenes from the past (the scenes in the Falklands were particularly effective), it proved to be a very engaging film; which is why this structure ultimately lets it down, and I left the theater feeling rather disappointed with how it failed to fulfil its full potential. Alongside all of this, the theme of Thatcher's dementia in the present narrative comes across as quite controversial and close to the line, especially considering that she is still alive today! Whilst it is clear what the film is trying to achieve and say with the visual metaphors of Thatcher talking to her deceased husband (with certain shots featuring him and others not), it is a large claim to make that Thatcher herself does experience hallucinations and still talks to her departed other half alone in her home. This is incorporated into the film with no apparent evidence or proof that she does actually do this (as far as I'm aware), which could raise moral questions about this as well as questions on how accurate the depictions in this film actually are. Margaret Thatcher was well known for causing some controversy in her time, so it's only fitting that a film in her name should do the same too really! 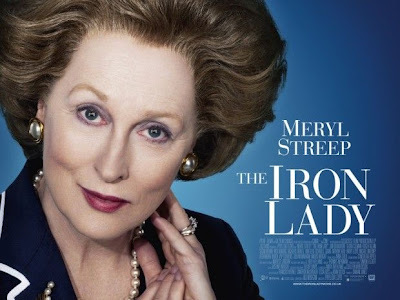 Whilst the film is by no means bad, and Streep's performance is fantastic, the weak narrative leaps between the interlinking narrative storylines prevented the film from reaching the heights of cinematic greatness that it could have and should have reached; The Iron Lady failed to become half the film that it needed to be. 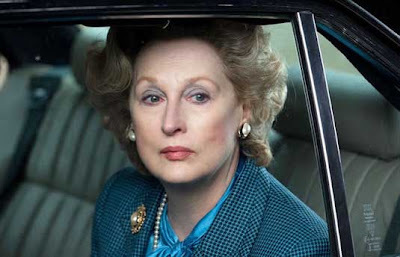 The Iron Lady is showing in cinemas across the UK now. Massively disagree with you. The story and wonderful insertion of flashbacks were fluid and totally worked. If they had not included those it would have literally just been a linear narrative - how ordinary and dull. And how insulted to an audience! I love the fact the audience were treated as intelligent beings, perfectly capable of handling the two different sides shown of Margaret Thatcher in this film, without it becoming bogged down with too much information. Superb film. I really believe you have grossly underrated this film. HOW you can put this film BELOW Radcliffe's The Woman in Black is sacrilege!